Richard Sherman wants to make a couple of things clear: First, he was fully aware of the impact that his NFC championship game rant would cause and second, and maybe more importantly, he liked it that way. 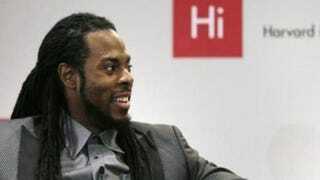 On Wednesday, the outspoken Seattle Seahawks cornerback told a standing-room-only crowd at the Harvard Business School that the rant that got him labeled a "thug" was part of a broader plan to expand the conversation about the perception of black athletes, the Associated Press reports. "I wanted to educate the uneducated," Sherman told the crowd. "I felt the need to turn the discussion on its head." While Sherman admitted his delivery was a tad excited, his words were spot-on. "I don't regret anything about it," he said. "I chose my words very carefully, though I couldn't control my tone. My delivery left something to be desired. But I knew what I was doing. When they called me a 'thug,' I provoked a discussion." Former NFL Players Association President Domonique Foxworth, Houston Texans running back Arian Foster and Arizona Cardinals receiver Larry Fitzgerald joined Sherman for two talks at the school. One talk, "The Modern Black Male Athlete," was given to undergraduates in historic Harvard Yard. The other, at Harvard's business school, was supposed to be about social media but quickly veered into a discussion of race, AP reported. According to the news site, Sherman repeated his earlier criticism that "thug" was merely an acceptable way of slurring black people, as he had never heard the term used to describe whites or Asians. "If you call Richard Sherman a thug, you have never seen a thug," Foster told the crowd. "It just blew my entire mind." Foster told the audience that the way in which Sherman handled the situation on football's largest stage went a long way toward understanding black athletes. "To have those discussions at Super Bowl media [day], that's huge," he said. Foxworth compared Sherman to 1968 Summer Olympics sprinters John Carlos and Tommie Smith who, after they won medals, raised black-gloved fists to call attention to the mistreatment of blacks in America, AP reported. "They worked their entire life to win that sprint, and when they got on the medal stand they put up their fist to let people know we had a problem," Foxworth, who played for the Broncos, Falcons and Ravens told the crowd. "I'm proud of what Richard did. He forced us to have a conversation."